The magnificent Kozjak Waterfall, also named Slap Kozjak, is probably one of the most scenic nature spots to visit in Slovenia. 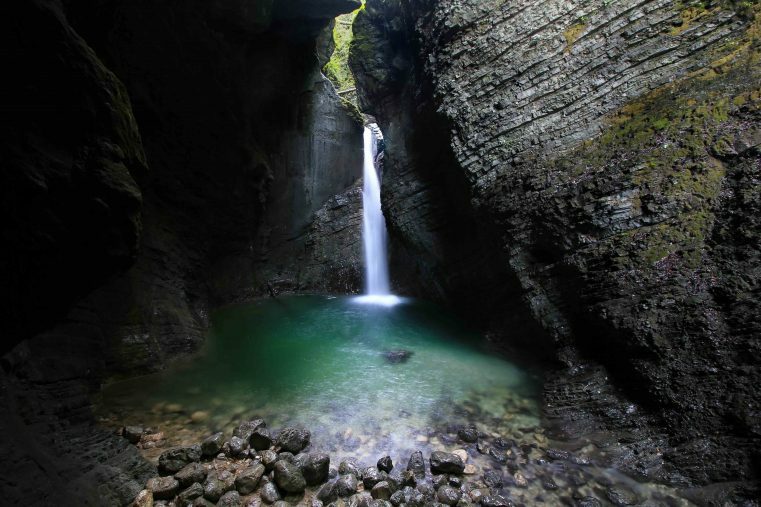 The waterfall is not far away from the small town of Kobarid and can be reached easily by a comfortable and easy hike. 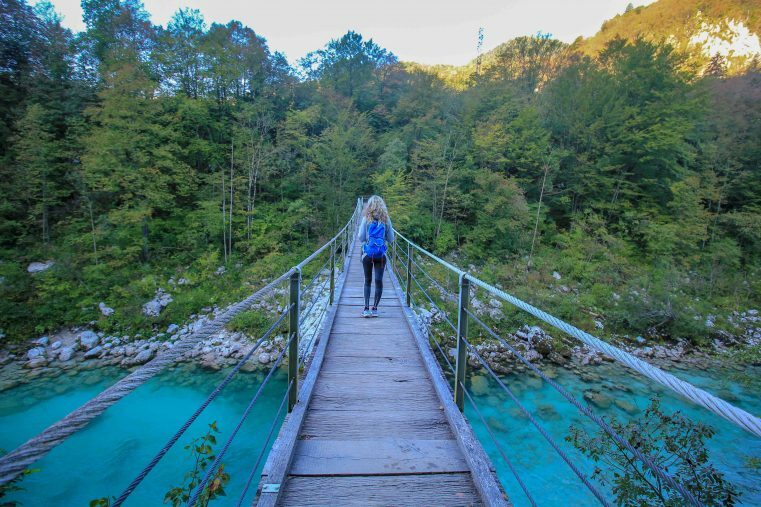 A short trail leads through an incredibly beautiful scenery of vast green meadows, next to the famous emerald green Soca River and inside a mystical deep forest and, at the end, the wonderful Kozjak Waterfall located in a cave-like area. A real paradise if you love nature spots and waterfalls! The hiking Trail begins in a green meadow on the opposite of the parking slot. After a few minutes you will reach the famous emerald green river called Soca River where the foot path winds along the side. 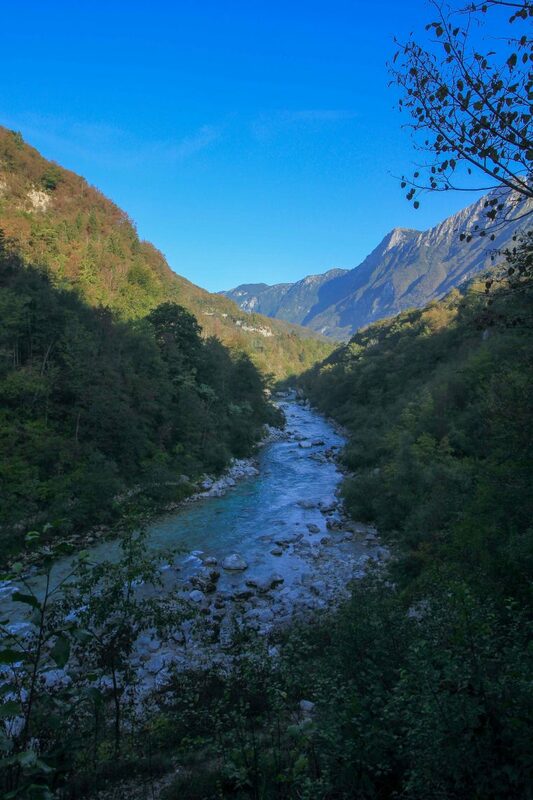 We were fascinated by the breath-taking river views along the hiking trail. If you dare you should definitely walk on the thrilling high wooden hanging-bridge, it’s very scenic and definitely worth it! Just after walking a bit further you will reach the forest and the nearer you come to the Kozjak Waterfall the forest becomes deeper and more mystical. 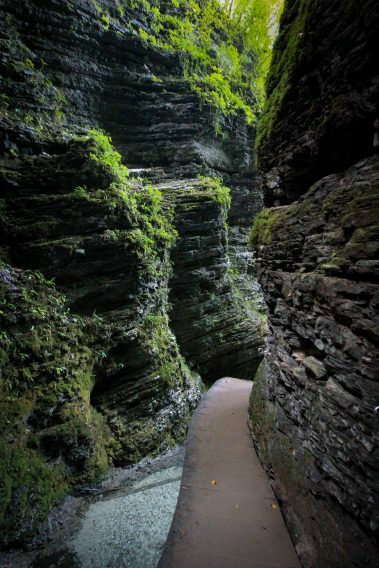 You will be amazed by this magical trail! 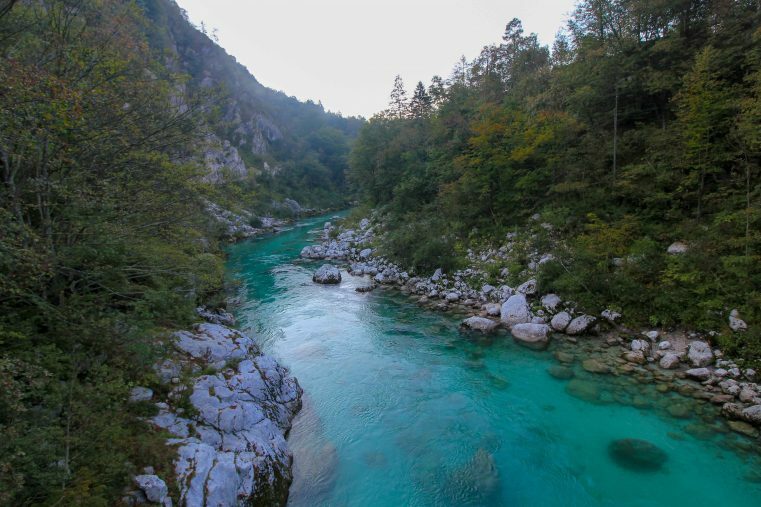 The Kozjak River streams in the Soca River and on its way it creates 6 waterfalls. On the hike you are going to see 2 of them where the second one is the main one. Passing the first waterfall the scenery gets even more enchanted: tiny stony bridges without handrails are crossing the river and wooden walkways attached to the high rock walls are leading towards the bursting waterfall. 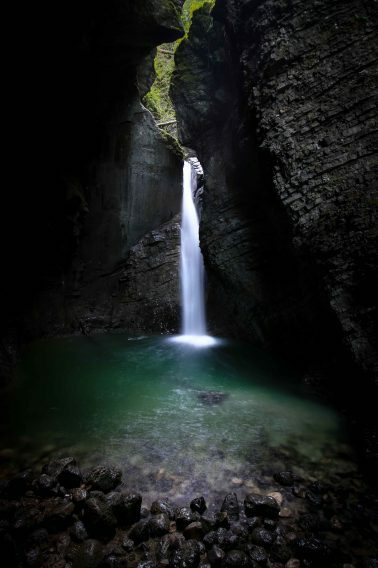 After a short walk you reach the Kozjak Waterfall, hidden in a big semi-cave. Without a doubt, the ambience there is absolutely breath-taking and beautiful – a place filled with wonder. Nearly there you can already hear the powerful falls. At the end of the trail there is a small wooden viewing platform where you can get close enough to see the whole beauty of the 15 meters high waterfall. Especially in the morning when the forest is misty and tourists are still away, a visit to the Kozjak Waterfall is an unforgettable experience! Swimming in the Waterfall is in general possible. Above all in summer time, some people swim in the natural pool but keep in mind that the water is ice cold and a bath is at your own risk. The Kozjak Waterfall is part of a protected nature area and because of that swimming inside the pools isn`t recommended. How to get to Kozjak Waterfall? 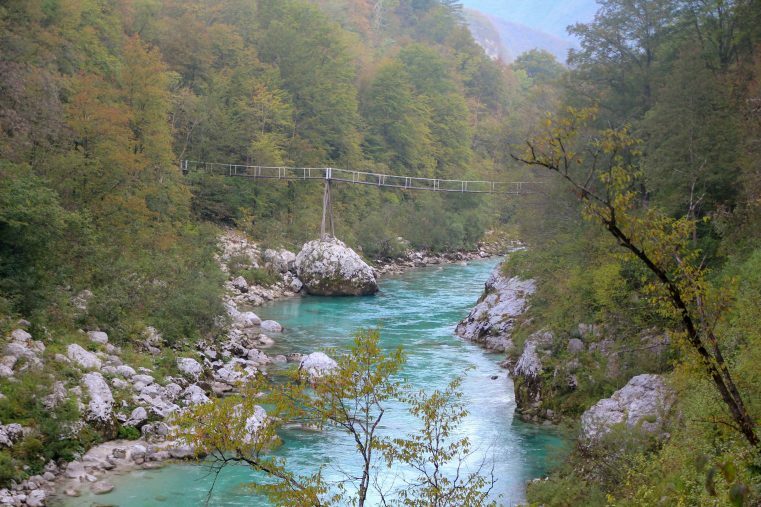 Drive by car from Kobarid in direction to the Napoleon Bridge, cross the bridge and turn toward Dreznica. After approximately 150 meters there is a parking lot on your right side (near Kamp Koren). 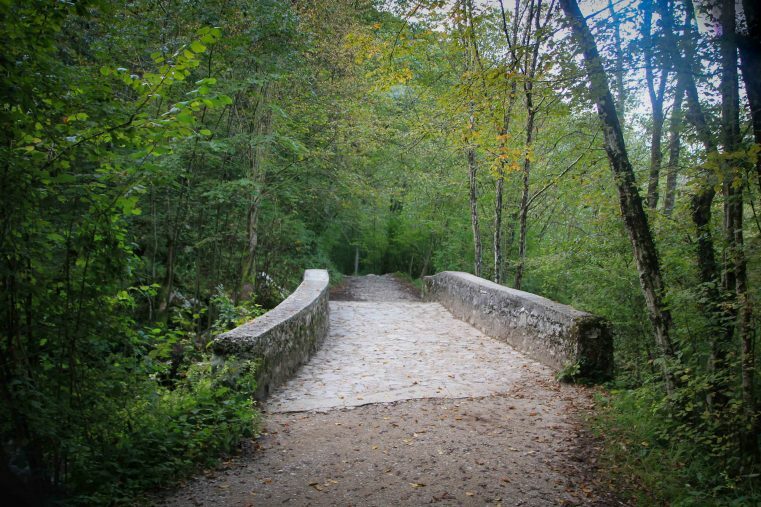 The walking duration of your hike to Slap Kozjak is around 25 minutes starting from the parking lot 150 meters past the Napoleon bridge or 45 minutes from the town Kobarid. The trail is well marked and easy to walk. The entrance to the Slap Kozjak is for free, you only pay for the parking. The two best option for staying is the town Kobarid or the lovely sleepy and amazing town of Dreznica. In both places you are going to find plenty of apartment options. In our opinion, the Kozjak Waterfall is one of the top waterfalls in Slovenia and we highly recommend a visit! We’ve been to summer holidays in Soča valley a couple of times. 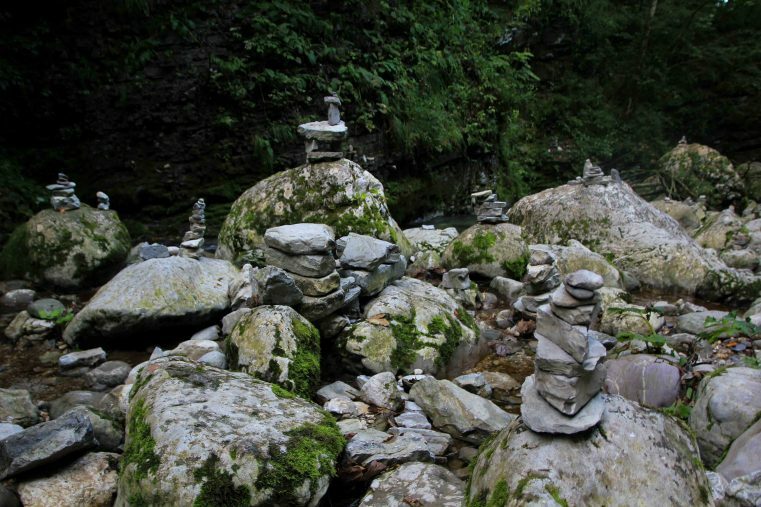 We stayed at Zatolmin once (relatively close to Kobarid), but went hiking to the wellspring of Tolminka river. Your post just reminded me how much I like that part of the world (haven’t been for 3 years now)- next time we visit, I’d love to hike to Kozjak waterfall (I’m not swimming in those freezing cold waters though!). Just left Slovenia but we were there for only 3 days. Heard of the Emerald River and its waterfalls but ran out of time! What a stunning hike. Even if there was not a beautiful waterfall at the end it would be worth the effort. That waterfall is the icing on the cake. It truly looks like something out of a fairy tale we would love to see it in person. What a beautiful beautiful place! I keep hearing and reading and seeing more and more about the beauty of Slovenia, and here’s another great example. I love that there are flat paths created to help people reach the waterfall, even though the ones over the water but without handrails look a little scary for those of us with vertigo, the flat paths themselves are so helpful! The colour of the water is glorious! I keep seeing photos and blog posts about Slovenia and it just looks incredible! I’m gonna have to go soon and definitely will be visiting this waterfall. Such a beautiful shade of blue. 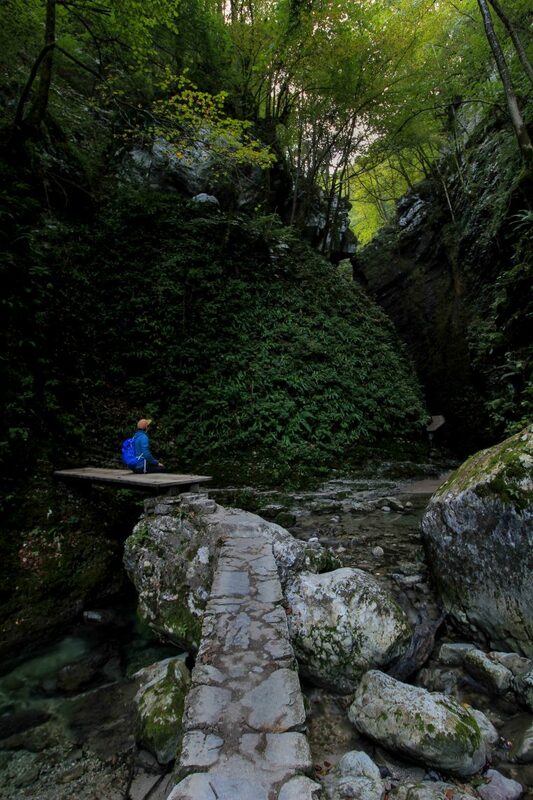 Kozjak River + seeing 2 of the 6 waterfalls along a path that features tiny stony bridges + wooden walkways attached to the high rock walls + the trail ending at the spectacular Kozjak falls? How could I NOT fall in love with this destintion. Love the photos. Absolutely magical. The color of that water is just MESMERIZING! The journey there looks like so much fun. My kids would love that hanging bridge… more than me 😉 I’d definitely go in the early morning, thanks for the tip.